Pharrell just hit the stage for a rendition of his hit, "Happy." Though much of the attention has been on the 3M adidas shorts suit he wore on the red carpet, the Internet has moved onto his onstage outfit. Everyone basically thinks he looked like a bellboy, and have been making comparisons to Wes Anderson&apos;s 2014 film, The Grand Budapest Hotel. 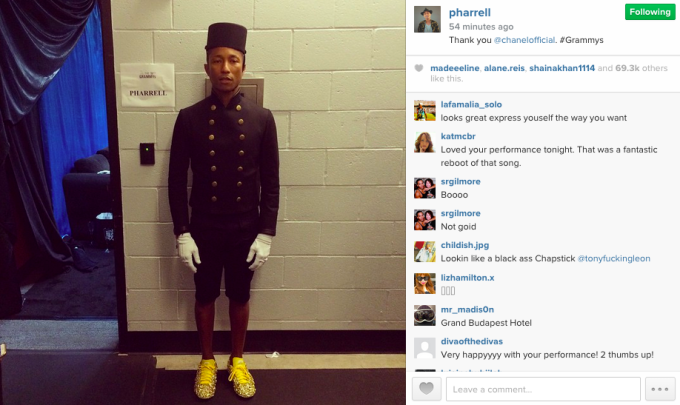 UPDATE: Pharrell let everyone know that he was actually wearing Chanel, via Instagram. Why is this inception grand budapest happy? Because I&apos;m happy I work at the Budapest Hotel. Pharrell just can&apos;t stop wearing shorts..! Is this a Wes Anderson movie? Does he work at the Grammy Budapest Hotel? Now Pharrell dressed like a character from the Grand Budapest Hotel. Tomorrow, everyone who made a Grand Budapest Hotel joke has to stay late after school. Don&apos;t wanna see anyone jocking the bell boy hat. V Magazine got it right, though. It looks like Pharrell&apos;s outfit was similar to the one he wore in the Chanel Métiers d&apos;art film he starred in with Cara Delevingne.